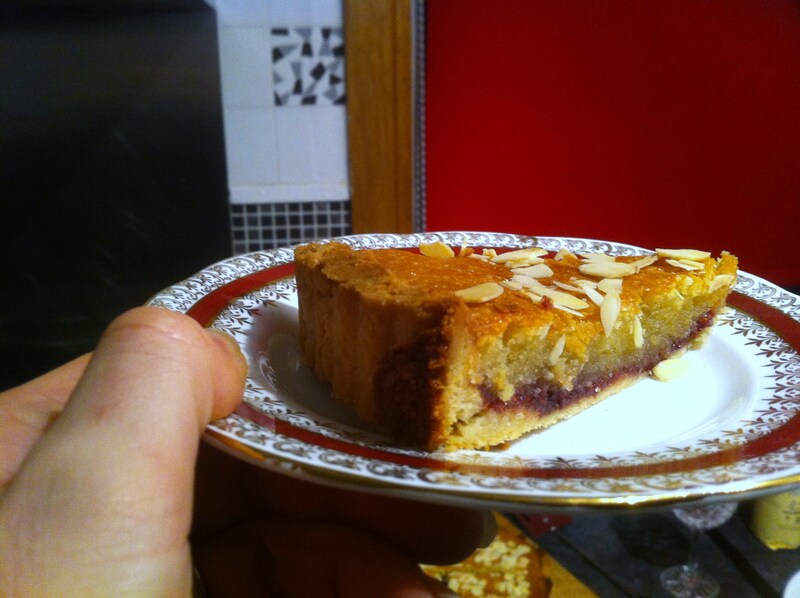 Any excuse for a little baking… I had ground and flaked almonds in the cupboards rapidly about to go out of date* and home-made raspberry jam in the fridge so Bakewell Tart beckoned. I borrowed from the Mary Berry recipe as her recipes are excellent, but in my new tradition of confident baking I fiddled a little with the recipe. The impulse is born not out of arrogance – ‘of course I can do better’ – but more because I’m not keen on being told exactly what to do. The inner rebel emerges and recipes are thus adapted**. Mary, as you may know from her TV appearances, is whippet thin and therefore I conclude that baked goodies aren’t a big part of her daily diet. I, of course, am on the wedding diet so would also promote her message –eat delicious home-made cakes and biscuits in very small quantities no more than two or three times a week and enjoy a lovely life! To make the pastry, measure the flour into a bowl and rub in the chilled butter with your fingers until the mixture resembles fine breadcrumbs. You can also use a food processor or – a ‘me trick’, use a handheld blender, dipping into the mix briefly and pulsing. Once breadcrumbed, add the water slowly, mixing until the flour and butter mix together all comes together. Roll out on a lightly floured surface and use to line a 20cm loose-bottomed tart or flan tin. Allow the excess pastry to hang over as it will shrink. Prick it all over. Chill for 30 mins. Line with foil and fill with baking beans or rice (to weigh the pastry down). Cook for 15 minutes, then take out the foil and baking beans/rice and cook for another three minutes to dry it out. Take out and allow to cool for five minutes. Spread the jam evenly over the base. Melt the butter in a pan, then take off and add the sugar. Stir until dissolved and add the ground almonds, beaten eggs and lemon juice. Pour into the pastry base. Sprinkle over the flaked almonds and bake in the oven for 35-40 minutes (watch the pastry as it may burn over this time). Serve warm with ice-cream or whipped double cream. Or served cold – still yum! *Ahem. About to go out of date? Gone out of date several months ago. Ah well, Sandy and I lived to tell the tale, but I wouldn’t recommend it. **Sometimes anarchy ensues as a result of this culinary disobedience.